This past week was tough. I think my legs were tired from the long run and 10k the week before (BTW, still working on the race recap for that), and I was a little lacking in the motivation department. I still got out there, but it wasn’t quite as exciting and my legs were really dragging by the time I got my long run in on Saturday. 1.) I SIGNED UP FOR A MARATHON!!! Yes! I finally made a decision and signed up! I’m running the Cape Cod Marathon on October 26th! It’ll be my first time to Cape Cod (after living in the area for 8 years, it’s about time), and I can’t wait. It was a really difficult choice, but the route is supposed to be really beautiful. Let’s hope the scenery can carry me through the hills that start at mile 15. 2.) I saw some weird and interesting things on my long run on Saturday. I didn’t get a picture of any of them because they all happened after mile 14. At mile 14, I walked for a 1/2 mile because I was so exhausted. Once I’d started up again, I didn’t have the energy to stop, take a photo, and restart…so no photos of these amazing sights. * First, I saw a children’s triathlon. The part I saw was the boys ages 4 to 6 running from the beach to the bike transition. They were all so small…and running so much faster than me. I’m glad they weren’t all passing me on their running segment. * Lastly, I saw a man running backwards. He was dressed like a normal runner, wearing headphones, but he was going backwards. Up a bridge. We were going in the same direction, so we were face to face for quite a while, but no head nods or explanations came my way. I think this was stranger than the bicycle pirate. You know, it was pretty hot out there….could I have been hallucinating? Pirates? Backwards runners? 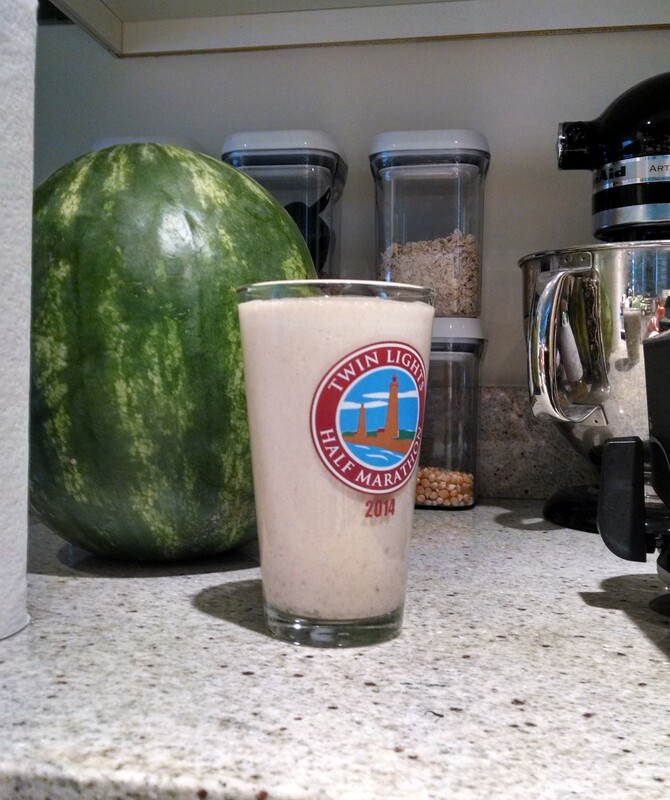 What was in my pre-run smoothie? 3.) The last highlight from the week is not running related. I took my second actuary exam on Friday, and I PASSED!!! Woohoo! Monday: Cross Training/Rest Day ::: Went for a walk. This coming week I’ll be taking a step back week, and I’m so ready for it. How was your week last week? What’s weirder: bicycle pirate or backwards runner? Choosing between a bicycle pirate or a backwards runner is like choosing between children! I’ll take the backwards runner only because he didn’t acknowledge his “weirdness”. I agree, I think the backwards runner was weirder. I spotted the bicycle pirate in Salem, and because weirdos are more common there, it makes the whole thing less surprising. WOO HOO!!!! Happy Marathon Training! That’s so exciting!! BTW you are a total genius for your scavenger hunt idea. I’m so doing that on Wednesday during my morning run. I’m so excited! I’ve been doing the training for weeks, but now that I’ve signed up, it’s really real! I’m glad you’re hopping on board for the Scavenger Hunt! I wonder if anyone is going to see a real horse. Congrats on making the decision! Cape Cod is beautiful, and I bet October will be perfect running weather. Thanks! I’m so glad I finally signed up, and I’m excited to see Cape Cod. I’m oddly intrigued by cranberry bogs, I hope I get see some. Haha you saw some crazy stuff on your run! Someone running backwards and facing me would totally freak me out! It sounds like you had a great week of running though – 16.96 miles is awesome! Thanks! It was so exhausting; I couldn’t eek out the extra .04 to get an even 17. Haha. Could the backwards runner see where he was going?! That would have bothered me if I had been running near him… I would have been watching for obstacles that he might fall over. So weird! Thanks! It’s a real weight off my shoulders. I’m excited about the marathon and visiting the Cape for the first time! The backwards runner couldn’t see where he was going. It was strange. I’m pretty sure I would have fallen over, if it were me.